Pot: a new golden goose for the booze biz? Hemp beers and those containing cannabidiol, a cannabis component that is not psychoactive, are already available. 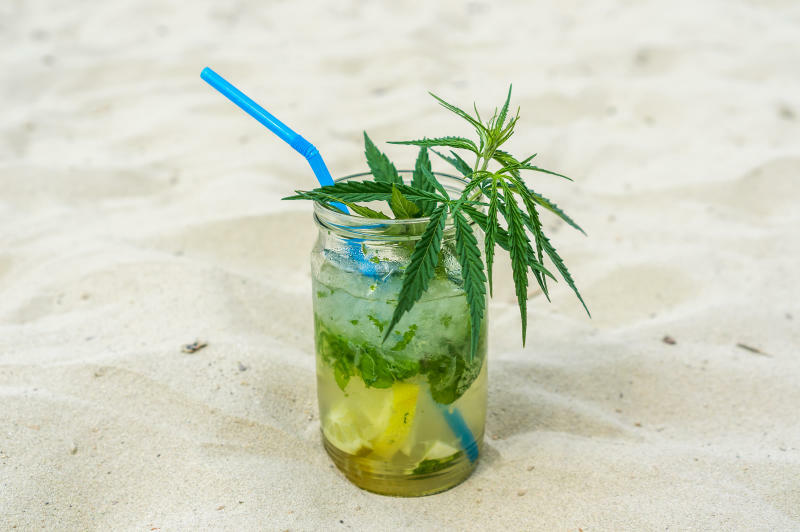 The world's major alcohol producers can no longer ignore the pot phenomenon, as young consumers may increasingly swap beer and cocktails for joints and cannabis-infused drinks. Some have decisively seized the moment. Constellation Brands, maker of Corona beer and Svedka vodka, has poured $4 billion into the Canadian marijuana firm Canopy Growth. The coming market is "potentially one of the most significant global growth opportunities of the next decade," said Constellation Chief Executive Robert Sands. Sales of legal marijuana and related products should reach $200 billion within 15 years and the market is opening "much more rapidly than originally anticipated," he said. Following in Uruguay's footsteps, Canada on Wednesday will become the second country in the world to legalize recreational marijuana. Cannabis is still banned under US federal law for any purpose but nine states so far have legalized its recreational use under their own laws, while others have moved toward softening its prohibition in recent years. As a result newer methods of consumption are proliferating: edibles in the form of candies, baked goods and ice creams as well as vaporizers and ointments. And then there are drinks. Diageo, the world's largest producer of spirits, including Smirnoff vodka and Johnny Walker whisky, is in talks with Canadian producers, according to Bloomberg. In response to a question from AFP, the company said only that it was closely watching the market. Beer producer Molson Coors has also announced a joint venture with Canada's Hydropothecary Corporation. Alexandre Ricard, CEO of Pernod Ricard, explained at the end of August that his company was keeping an eye on the market, especially to determine whether it was likely to "cannibalize" consumption of high-end liquors. And for now, the signals are mixed. Researchers at the University of Connecticut and Georgia State University last year found sales of alcohol dipped 12.4 percent in US counties where medical marijuana was legalized. But others, including the Distilled Spirits Council, an industry body representing liquor makers in the United States, say sales have not been hurt. "It is still too soon to say one way or the other," said Keith Villa, a Colorado brewmaster. Creator of the popular Belgian-style "Blue Moon" wheat beer, Villa plans to market a non-alcoholic brew containing THC, the psychoactive ingredient in marijuana. "As with a regular beer, you get a buzz that is similar to the alcohol buzz," he said. "But the next morning you should not have a hangover." While it is possible to mix alcohol and cannabis, he has not gone down that road. Doing so is illegal and the two substances can compound each other's effects, he said. Hemp beers and those containing cannabidiol, a cannabis component that is not psychoactive, are already available. There also are drinks with added THC. In California this summer, Lagunitas, a property of Holland's Heineken, began marketing Hi-Fi Hops, a non-alcoholic concoction that makes drinkers feel high. Southern Glazer, North America's largest wine and liquor distributor, has created a subsidiary specifically devoted to distributing cannabis in Canada. Soft drink makers, which have seen sales suffer as consumers turn away from high-sugar sodas, can't afford to ignore rising demand either. Coca-Cola has reportedly discussed producing cannabis-infused drinks with Canada's Aurora Cannabis. And while PepsiCo said this month it had no plans to develop a similar drink, Chief Financial Officer Hugh Johnston told CNBC the company would still "look at it critically." Canaccord Genuity analysts forecast sales of THC-infused and CBC-infused drinks could reach $600 million by 2022. Brewers have all the more reason to get involved, they say, since craft beers sales are no longer growing as briskly as they once were. The Distilled Spirits Council has avoided taking a position on legalizing recreational marijuana but it does say cannabis regulations -- on taxation, age limits and consumption prior to driving -- should be as strict as those for alcohol.